Motherwell have unveiled Zoom Airlines as their new club sponsor. The three-year deal is believed to be worth more than £200,000 to the Scottish Premier League club, which has just come out of administration. Motherwell majority shareholder John Boyle - whose brother, Hugh, founded Zoom - said: "This is a tremendous boost for the club. "It was important that we managed to secure a long-term sponsor. I'm sure it will be a great partnership." 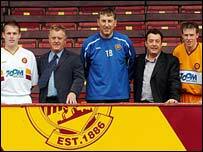 Motherwell say the deal increases financial security for the club, which went into administration two years ago. Zoom at the weekend began operating low-cost flights from Glasgow, Gatwick and Stansted to six destinations in Canada. And Zoom chairman Hugh Boyle said: "This is a great opportunity for Zoom Airlines. "I'm delighted to see the airline supporting the club John and I grew up with and, when he suggested that Zoom get involved, we didn't have any hesitation." Manager Terry Butcher added: "The team has done tremendously well this season and having a long-term sponsor in place helps us with our preparation for next season."